Reviews: Max For Ableton Live - real-time programming tool, Native Instruments Kontakt 4 - software sampler, Evol Audio Fucifier - mic preamp & distortion processor, Clavia Nord C2 - digital combo, tonewheel & pipe organ, Blue Sky Sat 8 & Sub 212 - 2.1 monitoring system, Empirical Labs EL9 Mike-E - microphone preamp & compressor, MakeMusic Finale 2010 - notation software. Technique: Guitar Technique: Mixing Bass Guitars - tips & technique, Joan Jett 'I Love Rock & Roll' - Classic Tracks. The Nord C2 takes the Hammond, Farfisa and Vox emulations of its C1 predecessor and plunges headlong into the Baroque with a very impressive pipe organ. Empirical Labs, purveyors of some of the most versatile compressors around, apply their dynamics expertise to a mic preamp. Hell-bent on achieving truly demonic distortion, we put Evol Audios oddball processor through its paces. The inventive spirit of one of the industrys true individuals, Stephen St. Croix, lives on in Intelligent Devices unique effects plug-ins. Ableton Lives devices offer powerful tools for mangling sounds in live performance. But what if you could mangle the devices themselves? Pianoteq tackles the virtual piano problem in megabytes rather than gigabytes, and offers flexibility that its multisampling competitors cant match. SE aim to deliver a complete vocal recording package for the project studio on a budget — do they deliver? Drumcores come a long way, and version 3 makes it easier than ever to use pro drummer performances on your tracks. Ensemble Pro opens up VSLs hosting technology to third-party instruments and allows 32-bit and 64-bit Mac and Windows systems to communicate over a network, spreading the software instrument load. Analogue warmth seems to be the Holy Grail in these digital days. But what is it, why does it hold such appeal, and how can you use it to enhance your recordings? Automation in Pro Tools goes way beyond the usual volume, pan and mute controls. We look at what else you can automate, and what's changed in Pro Tools 8. 10 concise tips to achieving a better bass sound in your mixes. Last month, we introduced Cubases VST Expression facility. Now its time to build your own multi-articulation instrument. DP7s new guitar plug-ins offer a fresh set of tones, and a contrasting approach to third-party alternatives. There are sure to be times when you need to export multitrack Logic files to other platforms. We explain the options. We go hip-hop this month, as we aim for a Dr Dre-style sound with Preslin Davis' track 'Side Effects', and highlight the importance of artist-engineer dialogue. These audio files accompany the Mix Rescue article that featured in SOS January 2010. Build sophisticated multi-tap and modulated delay treatments using Reasons flexible devices. Recording a solo performer requires a different approach from recording a band, and different ways of using Sonar. This month, we tame a strange space, record a sitar and dispense a little wisdom on EQ, compression and reverb, as we sort out Dominik Johnsons home studio. Joan Jetts heartfelt reworking of the Arrows I Love Rock & Roll became an international hit in 1982 and turned her career around. Glen Kolotkin tells us how it happened. As frontman with Queens Of The Stone Age, Josh Homme is arguably the biggest name in rock music. So how would he tackle a move into the producers chair with British indie superstars Arctic Monkeys? Britains biggest name in mixing, Mark Spike Stent has achieved international success in almost every genre. With Muses latest album, The Resistance, he was dealing with rock at its most epic. Music technology forums: the case against. Find that elusive synth preset when you cant remember its name, generate music from your own images, and catch up with the latest PC news bites. Q. How can I create the sound of a crowd? Read more about Q. How can I create the sound of a crowd? Q. Is phasing affecting the sound of my double-tracked vocals? Read more about Q. Is phasing affecting the sound of my double-tracked vocals? Q. What exactly is ‘headroom’ and why is it important? Read more about Q. What exactly is ‘headroom’ and why is it important? Q. What’s the best way to organise samples and effects? Read more about Q. What’s the best way to organise samples and effects? It doesnt do to get too precious about audio quality. In fact, sometimes a bit of lossy compression might be just what your music needs. 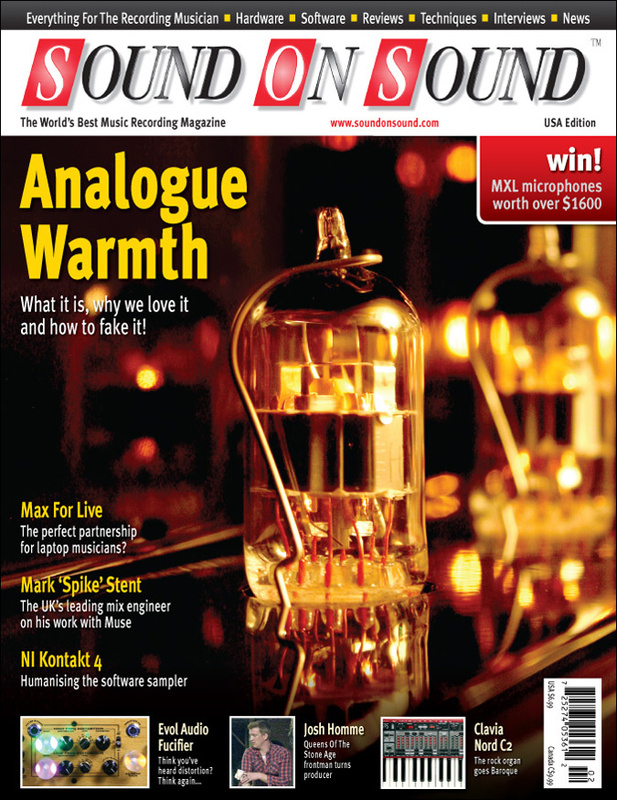 Media content for the February 2010 issue.